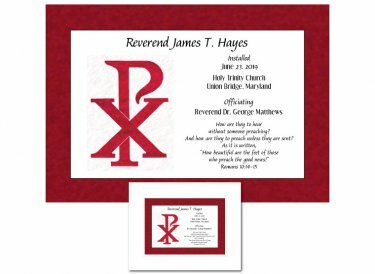 Commemorate clergy installation with a unique keepsake that will be treasured. This excerpt from the Book of Romans anchors the design: How are they to hear without someone preaching? And how are they to preach unless they are sent? As it is written, "How beautiful are the feet of those who preach the good news!" Personalized with name of the individual being ordained along with details from the ordination service, including the date, church name and location, and officiating clergy. Original design. Artwork is hand-finished using premium museum-quality materials. We use premium paper with Ultrachrome archival inks for vivid color, exceptional detail, and a lightfast rating of at least 100 years (as with any artwork, avoid hanging in direct sunlight). Your artwork will be double-matted with crisp, white premium quality matboard. 100% cotton and acid free, it will not yellow over time. It’s then mounted on archival backing board and placed in a clear, protective sleeve. It'll arrive suitable for presentation (many of our customers like to allow recipients the flexibility to choose the perfect frame to match their decor).